Prices haven't been frozen since the last review. I visited on a Sunday afternoon and although it was busy there were nowhere near the number of people you could expect on a weekday. As well as Fullers ales there was Dark Star Hophead on off and I seized the opportunity to sample it. Nice, but not the best pint I've had (see the Harp just of Trafalgar Sq.) but it was very drinkable. Baking hot day so I stayed inside as it was refreshingly cool. 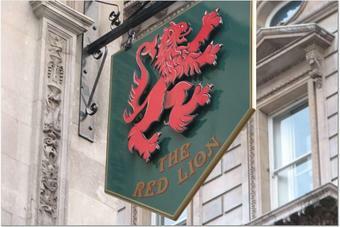 Very well decorated pub, ornate with a strong sense of history. Not surprising really being so close to the Houses of Parliament. There was a restaurant upstairs which appeared to be closed. Several people were eating in the main bar and have to say the meals looked very appetising. I didn't look at the prices! The beer here is always in excellent condition, however, due to its' location the prices are truly horrendous, not somewhere I would stay for more than one pint. This Fuller's pub at the bottom of Whitehall near Westminster station and the Houses of Parliament was absolutely packed on a recent Wednesday at 6pm mainly with local office workers / civil servants. After a fight to the bar I find 3 ales from Fuller's on cask and various other offerings including Frontier lager and their own Stout on keg. As the pub was so packed I quickly necked several pints of Seafarers which were excellent. We managed to find a standing space towards the door and sup our drinks without being bumped and pushed too much. The pub is laid out like an old fashioned parlour with etched glass windows, several interesting looking hanging light's and chandeliers. On a wall hangs a large picture of William Pitt the Younger and there’s also a script about William Shakespeare visiting the pub. A very attractive pub inside with a large separate dining room up stairs that was also very busy on my visit. 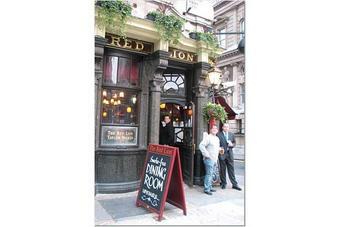 Very busy pub on Whitehall with sky-high prices. Almost a tenner for a lager and a bitter. 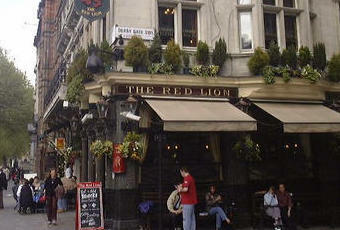 London Pride was, however, good and it's a characterful pub.